Our Red/Blue Lenses, Red/Cyan Lenses, and Red/Green Lenses are available in plain white, full-frame and hand-held styles. 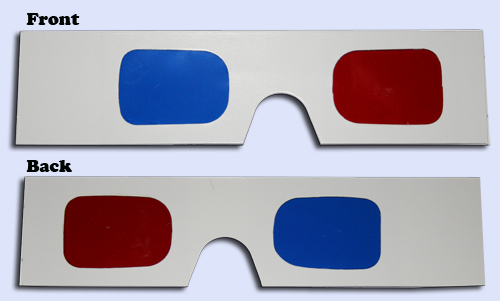 Anaglyphic glasses are used for viewing print, movies, websites, games, and computer applications in 3D and is defined as two views of the same subject (either moving or still) in contrasting colors and slightly offset for two different perspectives. A three-dimensional effect is produced when these scenes are viewed with two correspondingly colored filters (anaglyphic lenses) matching the colors in the image.